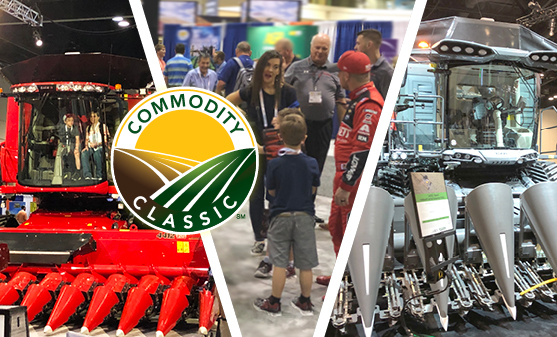 Trade show season is winding down and Commodity Classic (CC) is not to be left out. In contrast to the past five years, this year seemed much more low-key. Maybe it’s because we’ve come out of another tough year, and we’re heading into what seems like continued uncertainty in ag. We felt, more than saw, a vibe of slogging through another year… and less pie-in-the-sky dreaming. And though farmers were engaged in booths, we couldn’t get a sense for if they were in learn-to-buy, learn-to-plan or learn-to-dream mode. When we go to trade shows and conferences, we see them through two different lenses: the lens of the event producer who creates an environment that is larger than life, a spectacle that is inviting for the consumer and makes him or her want to do business; and the lens of the brand manager, who is there to sell a product or service and in whichever way possible, strike up a deal. As we navigated CC, we were reminded that we’re operating in yet another ag environment. It wasn’t lost on us the impact of recent years’ mergers and acquisitions with the shifts in the size and number of booths. We also noted a few new ag brands that were notably absent on the trade show floor, despite their presence on shirts in hotels and airports, and could only assume they took advantage of CC to meet with and entertain customers. Comparatively, in our week prior at the Western Veterinary Conference (WVC), we saw stunning, well-orchestrated booths consuming as much overhead space as at ground level. At CC, there were bigger, more extravagant designs featuring bold headers and overhead signage, but most of the up-top disruption came from combines, tractors, sprayer booms and grain carts – familiar things that still catch farmers’ eyes. Though it’s easy to make comparisons from event to event, the differences for better and for worse are also quite recognizable. And between conversations at WVC and at CC, we repeatedly heard marketers struggle with determining the value and measuring the ROI of exhibiting at shows. With budgets that need to work ever harder, many marketers debate yearly their participation in a trade show. They know that while a show represents only a sampling of their target audience, it is still a good opportunity to connect and gauge customer sentiment and points of interest about products and services. The costs for exhibiting at events continues to climb no matter what sector or location. The quality of leads and in-booth collected data can vary dramatically with the challenges of self-reported data, repeat visits to a display and the tchotchke collectors. While overall traffic numbers may seem high, the net number of quality visitors is often unknown. Then after the show, there’s a need to get the leads back to the field for follow-up. It makes us wonder: Does a marketer achieve more with private customer/prospect events? Today we have a new generation of farmer. We’re seeing a more diverse population and a whole new world of technology that is advancing ag and solving problems for farmers that they didn’t even know they had. Perhaps it’s time to start marketing in a way that we’ve never considered before. We saw the full range, including: data and tech service companies; ag retailers; equipment manufacturers – full-line, short-line and aftermarket attachment and device manufacturers; aerial monitoring and data capture services, along with those capturing in-canopy, root-level and deep sub-surface data; plus production, marketing and risk management providers that leverage the data for farmers. No matter what direction you looked across the show, it was clear technology was top of mind. This leads to many questions: How do farmers sort through it all? How do they determine what they need and from whom? How do they know who to trust… and how long will that provider be in business? How do they know how to make it pay… or when it will pay? Are rural broadband issues being resolved in terms of access, reliability and speed? We left Commodity Classic energized about the scope and possibilities of where equipment and technology are headed. We also left wondering how we can help marketers and farmers answer those questions and many others about ag tech. Can we market products and services to a population that isn’t sure what to do with them and how to extract full value them just yet? The onus is on us to ensure that we know our market, can educate them properly and can provide them with the tools to enhance their lives, increase their yields and make their farms more prosperous than ever. For more information about our approach to marketing in the agriculture industry, download our R+K Ag Credentials or contact Gino Tomaro, Business Development Director.